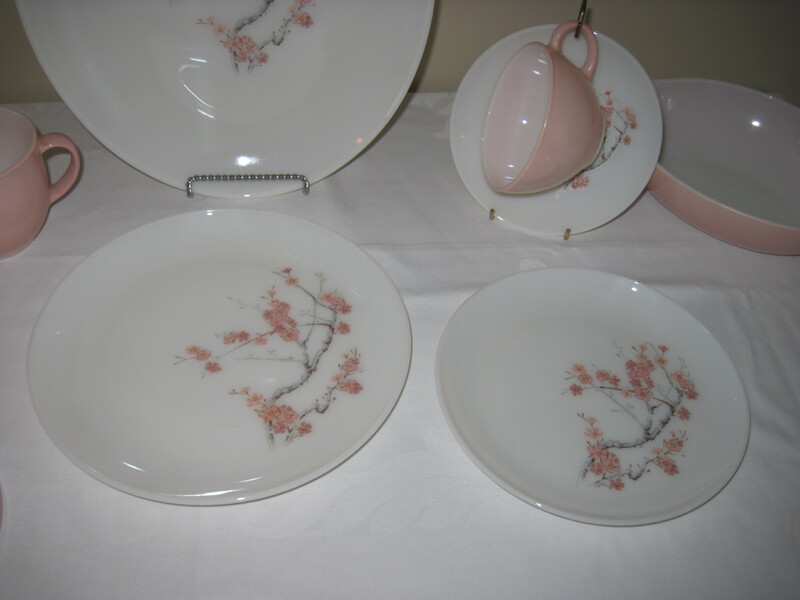 These dishes are so pretty with very soft and feminine colours. I have a complete set of 12 place settings which includes dinner plate, side plate, cup and saucer, and lug bowl. Completer pieces are as shown; large platter, vegetable serving bowl, cream and sugar (with lid). All dishes are in very good, clean condition, with little usage. These dishes will be for sale shortly at my booth at the Almonte Antique Market, 26 Mill St. Almonte Ont. Price is $40.00 for EACH place setting. Completer pieces will be priced separately. Platter $25, Vegetable bowl $18, Cream and Sugar $25. PLEASE NOTE THE PLATTER AND CREAM AND SUGAR HAVE BEEN SOLD!! These are very rare and hard to find dishes as they were only produced for 2 years. There were five patterns to choose from when this coupe-shaped dinnerware was introduced: Field Flower, Pine Cone, Chinese Grass, and Quince which was available in Pink or Yellow. Within one year Field Flower and Pine Cone were dropped and the remaining patterns were re-named. Quince became Pink Petal & Yellow Petal, and Chinese Grass became Sea Isle, which is turquoise. Dinner plates, side plates, saucers and oval platters are patterned, and cups, soup/cereal bowls and oval serving bowls are solid-coloured. Creamers & sugar bowls are also solid-coloured, but sugar bowl lids are patterned. Family Flair was sold in 20-piece sets comprising four place settings. The product line was available for two or three years. PLEASE NOTE ALL THESE DISHES ARE SOLD!!! Lovely set. I too have these and just sold the 14″ platter. I love the solid pink colors. I am interested in buyng this set. How much for the complete set and s/h to Phoenix, AZ? Email me at shrike4@rogers.com and we can discuss the details further. I will have to check at my antique booth to see whether any of the dishes sold yet or not and get back to you. 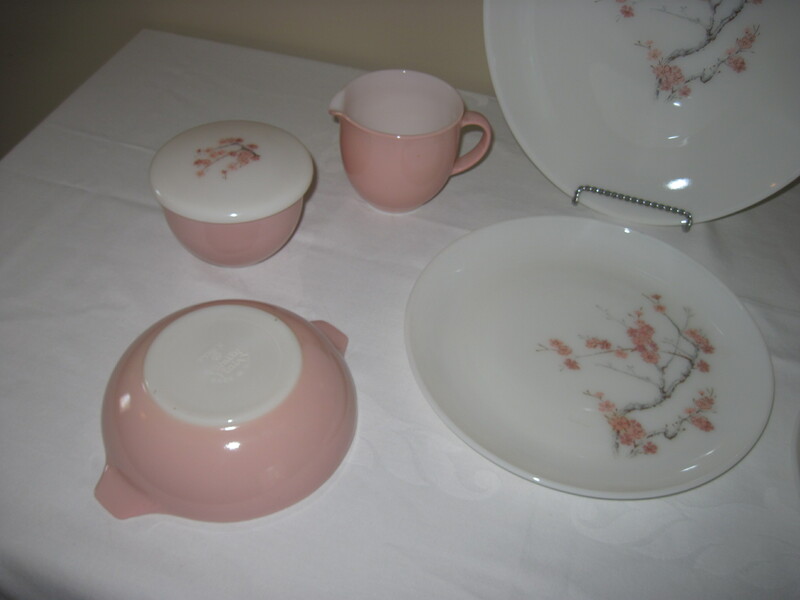 I would like to buy the creamer and sugar bowl and platter if they are still available. 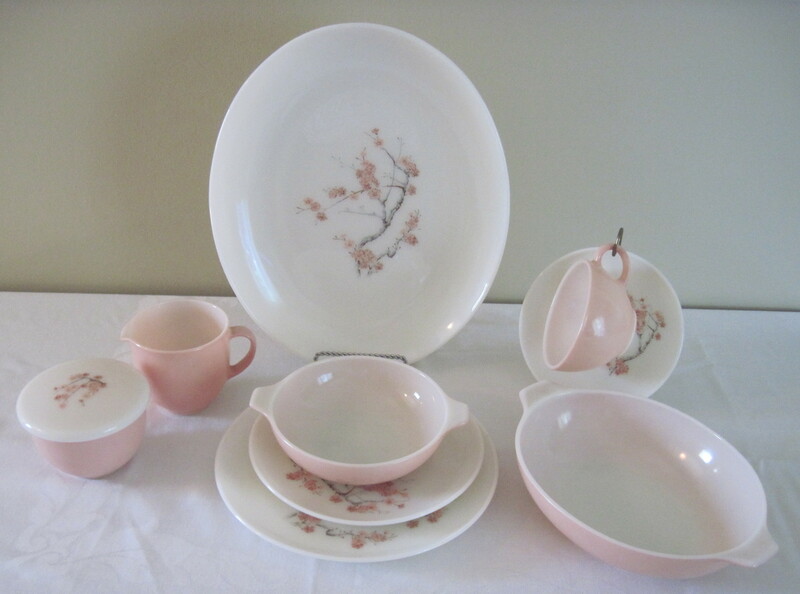 These are my late parents’ wedding dishes… it would mean the world to me to complete my set. I realize this is a really old post, but do you still have any of these? Sorry. They were all sold. Sorry, all of these dishes were sold some time ago. Thank you.